“Shuffleton’s Barbershop’’ by Norman Rockwell. 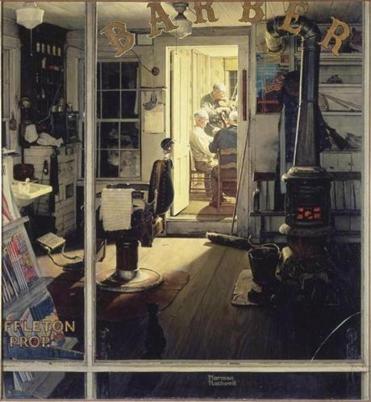 Norman Rockwell gave the Berkshire Museum in Pittsfield his wonderful painting “Shuffleton’s Barbershop” in 1958. Most of his family members, including his son Thomas, believe this painting to be one of Rockwell’s best. His son Peter says it’s his favorite of all his father’s paintings. Some art critics say that “Shuffleton’s Barbershop” is Rockwell’s masterpiece. It depicts an old-style barbershop, an ordinary shop in East Arlington, Vt., where some magic is taking place. The viewer peers from the street, through the outside window into the cluttered shop, where a fire burns in the stove and a broom rests against a wall, and then the eye is drawn still further, deep into the back room, where some ordinary old men play some extraordinary music bathed in the light from Rockwell’s brush. It is a marvelous work that should be seen and admired by many. Norman Rockwell gave the museum the gift of this painting so that it would be seen and appreciated by his Berkshire neighbors. For all these years, the painting has been kept at the Berkshire Museum for visitors to admire, until now. The Berkshire Museum is planning to put the painting and 39 other works up for auction at Sotheby’s and expects them to yield $50 million. The beloved painting is being removed from the museum’s permanent collection and, if the auction proceeds as planned, it could be lost from the Berkshires to some private collection where members of the public won’t be able to admire it again. That would be a great loss. Another Rockwell painting, the “Shaftsbury Blacksmith’s Shop,” is among the other 39 works to be auctioned off at Sotheby’s. Family members regret that this painting, another gift to the museum, could also be lost from the public realm. One of Rockwell’s grandsons remembers admiring his grandfather’s painting in the Berkshire Museum. As a boy, he loved the flying sparks as the two blacksmiths hit their anvils, and he found this painting to be more exciting and dynamic than the masterful “Shuffleton’s Barbershop.” What made it even more special for him was that it features a self-portrait of his grandfather depicted in the crowd. The Rockwell family understands that only a serious financial crisis would force a museum to put so many treasures up for auction. Apparently, a lot of thought has gone into what the Berkshire Museum needs for its future, and it has decided it doesn’t need these two paintings. The paintings are to be sold to pay for a $40 million endowment and a $20 million renovation. While we wish the Berkshire Museum well, we wonder if there isn’t another way. Perhaps a group of philanthropists could be found to make sure these paintings stay in the Berkshires. We encourage the museum to consider an alternative for raising money to keep the paintings in a public institution. Could a public appeal raise money so that the museum could transfer the paintings to the Norman Rockwell Museum in Stockbridge? If so, they would not only be loved and cherished by generations of museum-goers, but they would also remain in the Berkshires, where they belong. Geoffrey Rockwell is Norman Rockwell’s eldest grandson. Margaret Rockwell is manager of the Norman Rockwell Family Agency.